Agitation for a Biafran state in a geographical location such as Nigeria is not peculiar to the country, there are other countries of the world whose indigenous people are beating the drums of separatism. Included in this discourse for separatism are agitation for autonomy and secession. There are indigenous people all over the world seeking greater autonomy in their States of origin. While others are clamouring to secede and form their own country in the country of their existence. The Kabyles, Movement for the Autonomy of Kabylie and Provisional Government of Kabylia are there in Algeria; The Cabindans with proposed Republic of Cabinda, The Lunda-Tchokwé with proposed Democratic Republic of Lunda-Tchokwé, are there in Angola. In Cameroon, Bakassi Freedom Fighters are not left out; Southern Cameroonians are there too. In the Republic of the Congo, State of South Congo and Kingdom of Loango are there; in the Democratic Republic of the Congo, Bas-Congo is there, Katanga with their political movement (Union of Independent Federalists and Republicans) and militant organization( Mai Mai Kata Katanga) are there. In Egypt, Coptic ethnic group with Coptic Pharaonic Republic and Coptic Diasporan Christians are there. In France, Popular Front for National Liberation is there. In Morocco, Western Sahara with proposed Sahrawi Arab Democratic Republic is there. Be it in Spain, Catalonia is there; in Britain Scotland is there; Namibia, Caprivi is there; Kenya, Mombasa is there; Libya, Cyrenaica is there; Mali, Azawad is there; and others. So agitation for autonomy or secession is not peculiar to Nigeria. But what is peculiar to Nigeria is the method of creation of the country. Nigeria is the only country in the world with a geographic appellation that forced unrelated, dissimilar, incoherent ethnic groups and nationalities together. It is no more news that Britain formed Nigeria through Flora Shaw and Fredrick Lugard in 1914. Britain did not conduct any referendum to allow the diverse nationalities and people decide whether they wanted to coexist or not rather they joined oil and water, cats and rats to cohabit. It was unfortunate. The difference between Nigeria and all other countries where member States are clamouring for either autonomy or secession is that Nigeria is simply an Artificial Creation of Britain whereas others are not. Then when Britain joined Arewa, Oduduwa and Biafrans together, the people of the lands were intellectually disabled, poor in reasoning and weak in envisagement, if not, they could have known their rights, reasoned to determine what was in the dubious mind of Britain. Because Britain did not use the power of guns and bullets to join them but they manipulated the minds of the people to believe that the Whites'(Britain's) culture, religion and traditions were superior to theirs hence the will-power to object to the whims and caprices of Britain was disappeared. But now, New crops of indigenous people whose fathers and forefathers were forcefully amalgamated have been born. People who do not buy the idea of Britain forcing them to cohabit against their will. People who know their God-given rights as well as universal right to freedom. They have risen up and have seen the ill-conceived, detrimental and destructive amalgamation of 1914 and how it has been claiming the lives of innocent people, unabated. And they have risen to say NO to the cohabitation. NO to one-Nigeria. NO to marginalization. NO to extermination of their race. NO to economic policies meant to subjugate them. NO to imprisonment. NO to injustice. NO to tribalism. NO to Britain's ideology and economic interest that puts Biafrans on perpetual death toll. They are Biafrans, whether they are IPOB or MASSOB, BZM, or any other umbrella they gather in. They have come to challenge the continued existence of the Artificial Creation of Britain in West Africa suitably called "Animal Kingdom" according to Senator Shehu and Aisha Buhari. One of the most vocal and widely known mouthpiece of the Biafrans is Mazi Nnamdi Kanu. And he has questioned the reasoning capacity of the people called Nigerians who were and are still treated like animals. Nnamdi Kanu has argued that it is only animals that can be possibly gathered together and given a name and they would accept; and lately, as I have mentioned above, Aisha Buhari, Nigeria's purported First Lady and Senator Shehu Sani representing Kaduna Central have towed same line of thought. But I have asked these questions without any Brit giving me an answer: Who gave Britain the right to join Biafra, Oduduwa and Arewa together and force them to cohabit? Why won't Britain cohabit with European Union, where British citizens are not killed or abused? 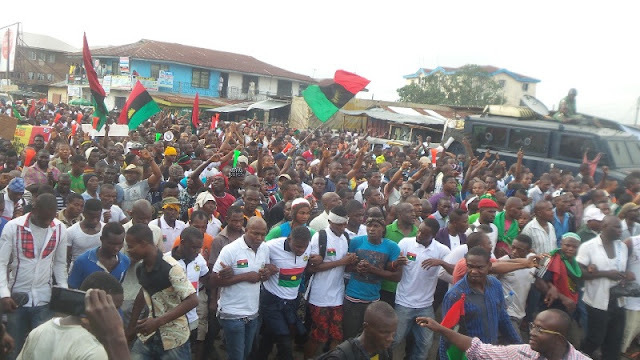 Can we see that the separatism agitation is not peculiar to Biafrans? Because the same Britain that forced Biafrans into this unholy union with Hausa-Fulani and Yoruba, is opting out of European Union. There is something I do not yet understand. While opting out of European Union, Britain has vowed not to allow Biafrans opt out of Nigeria. Is Britain wicked? The answer is YES as long as she continues her campaign against the freedom of Biafra. Moreover, apart from being an Artificial Creation, there are more reasons, which may be more peculiar to Nigeria than other countries, why Biafrans are opting out of Nigeria. They are obvious economic policies against them, marginalization, injustices against them, unprovoked massacres of their people by Hausa-Fulani Boko Haram, Herdsmen jihadists, amongst others. Since other countries of the world have agitators of separatism and Nigeria being the only Artificial Creation in the whole world, has more compelling reasons why her components should separate, it is only pertinent to use referendum to ascertain what the people want. It is already obvious that Nigeria CANNOT know peace unless a referendum is conducted. It is better not to postpone the evil day because it may prove more destructive than expected. Therefore, since Nigerians' opinions were not sought through a referendum before the amalgamation of 1914, and now the polity is most heated up as a result, let the Federal Government of Nigeria conduct a referendum to determine overall people's stance(not just a selected few who would serve their selfish interest) and subsequently uphold the will of the people after the referendum. By so doing, Nigeria will experience a long lasting peace.